Afro Ken (アフロ犬) is a Japanese character created by the San-X company, which creates other anime-style characters such as Kogepan. 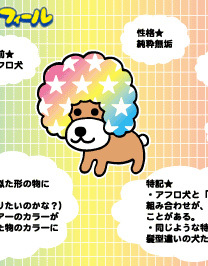 He is a dog with a rainbow-coloured afro. He is innocent and blameless and always in a good mood. Afro Ken is always willing to try new things. Afro Ken is attracted to objects that look like he does. His hair changes to look like these things as he gets close to them. In 2001, Bandai Visual and Sunrise produced a 3DCG OVA adaptation based on the character. The OVA was also broadcast worldwide by the anime satellite television network Animax.